When the rain comes, I don’t run and hide my head. I do however stroll about and look for a little bit of cover so I can do some drawing. 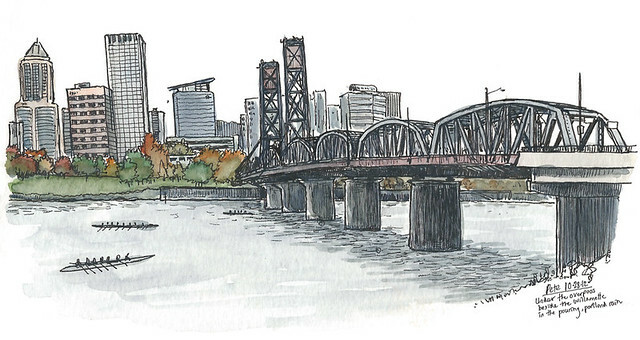 I love sketching bridges – no trip to Portland is complete without at least one bridge sketch. I like drawing bridges more than fire hydrants. Partly it is because I like being beside the river (as opposed to crouched just off the kerb hoping cars don’t hit me), but also because bridges represent that great connectivity of humankind, our ability to create cities and urban landscapes in tandem with the forces of nature, those big powerful (and very much alive) rivers. London exists because of the Thames, and prospered because it had a bridge (which admittedly kept falling down but that is another story). So when it rains, as it did in Portland (and occasionally in London too, I’m told), surely bridge sketching is a perfect sport? Not exactly. For one thing to get out of the rain you often have to go beneath the bridge, which makes drawing the thing a bit trickier. Thankfully decent covered vantagepoints do exist for the more intrepid urban sketcher. On Sunday lunchtime, with a modest hangover from the previous night’s PDX craft beer samplings, I made my way down the southeast waterfront to the Hawthorne Bridge (above). The rain was coming down in bouquets (Portland rain is sweeter, as I’ve said before) and there were lots of people milling about the water’s edge. Boating crews lined the river, and were one-by-one taking to the water, cheered on by colourful umbrellas dotted along the bank. The road that comes off the bridge is high and curving, and I found a spot far beneath where the driving rain could not touch me. Joggers and other happy, soggy people jogged and plodded about the path in front of me, so I stood slightly back on a slope of grass and sketched away as best as I could. I think my slightly swaying demeanour comes across in the sketch, and that’s why I like this one at the top so much. After about forty minutes or so it was time to move on, and walk through the rain. I had another rainy bridge experience the day before, at the end of a Saturday afternoon. I had spent the morning sketchcrawling (well, sketching, not so much crawling) with the fabulous Portland Urban Sketchers in two indoor locations in Old Town (that post is yet to come), and afterwards went to the Saturday Market. 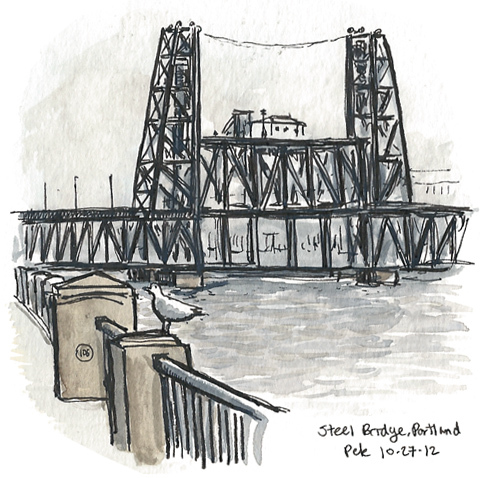 I drew Steel Bridge on my previous visit, but it’s a lovely structure and deserves to be sketched many times. 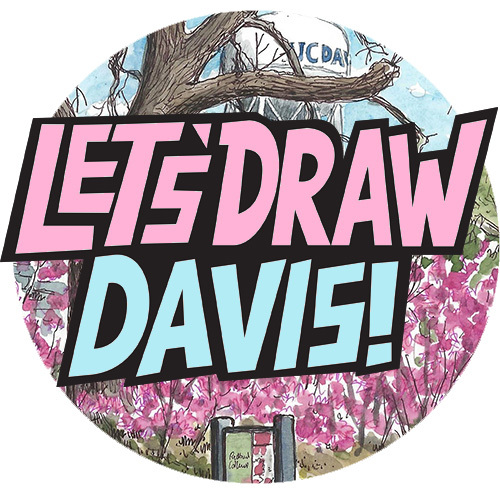 This one, below, took a lot less time than the 2010 one, partly because I was sketching in almost direct rain. It wasn’t heavy rain, just a light sprinkling really, but there really wasn’t a good location beneath Burnside Bridge to sketch the view I wanted, so I took my chances. Still, once the pen started to protest at this treatment, I wrapped it up, but I was happy with it. Very nice Portland bridges! The Hawthorne Bridge drawing is lovely, leading the eye to downtown. Love the rowers down below. In the other, you really captured the strength of the Steel Bridge. cheers Vicky. Daamn, Portland is a cool place. I like both of these but especially the top one with that little hint of autumn glow. Well,maybe you are going to have to pack your bags and move your family here. As a Londoner you will feel at home with the weather.